Summary: A surprisingly nice state park located near Cannonville UT with plenty to do and see. Like all UT state parks, there are fees for everything: entry fee $5 per car load, bicycles and walk ins $3, showers $2 per person (plus the $5 entry fee), camping $14 per night (includes shower). 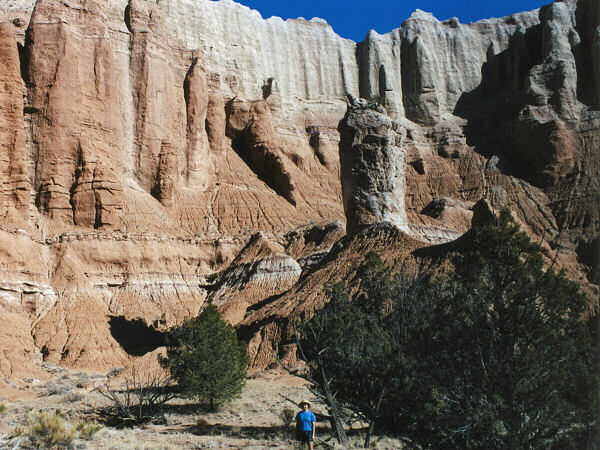 The main feature of the park are the many sedimentary pipes (also called geysers) in the area. The park contains 67 of these pipes which geologists believe to have originated in one of two ways: as injections of liquefied sand triggered by earthquakes, or as remnants of ancient springs. 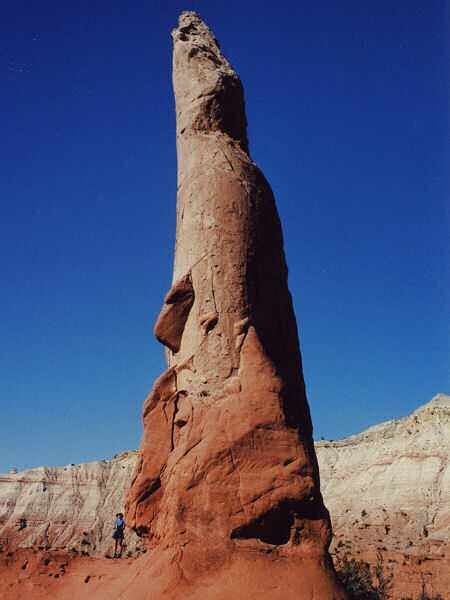 The spires were left standing after the softer Entrada Sandstone surrounding them eroded away. Evidence near the park suggests that Native Americans were the first to wander through this area. Around the year 1900, cattlemen from Cannonville and Henrieville ventured into this basin, called it thorny pasture and used it for winter grazing. In the summer of 1949, the National Geographic Society sent an exploration party to document and photograph this uncharted area. Using Kodak's Kodachrome film to capture the areas vivid colors, they named it Kodachrome Flat. The story of the exploration can be found in the September 1949 issue of National Geographic Magazine. The area was designated as a state park in 1962. 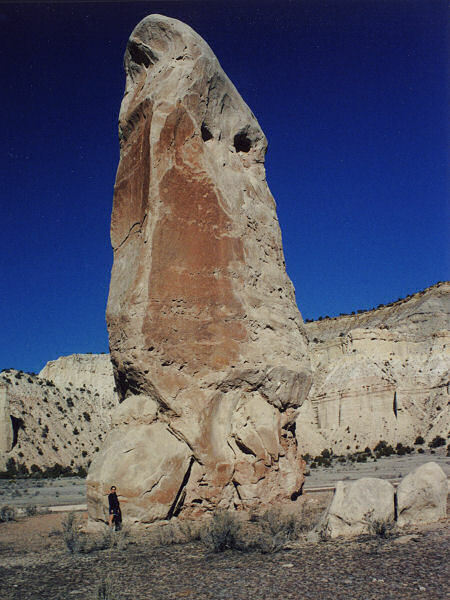 Fearing repercussions from the Kodak film company for using the name Kodachrome, the name was changed to Chimney Rock State Park, however, within a few years Kodak gave permission to rename the park Kodachrome Basin State Park. Directions: This state park is located on the north end of Cottonwood Road (which connects Highway 89 with Highway 12) just south of Cannonville, UT. Hike Description: Pick up a trail map at one of the kiosks in the park. 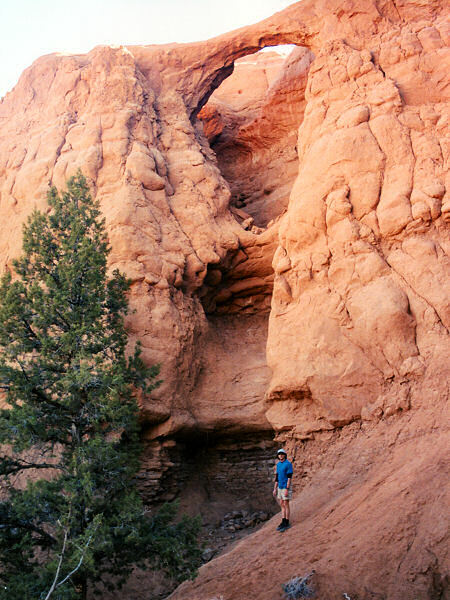 Shakespeare Arch Trail: A ½ mile self guided hike (pick up a guide at the trailhead) to a small natural arch. Time to complete = 10 minutes. Sentinel Trail: A 1 mile loop trail that starts near the Shakespeare Arch on the right. This trail basically loops around then on top of the rock formation in which the arch is located. The trail doesn't quite seem finished and becomes somewhat faint near the end (follow the bits of pink flagging tape tied to the brush). A sandy descent brings you back to your car. Time to complete = 40 minutes. Grand Parade Trail: A level 1½ mile long loop hike that takes you in and out of some nice box canyons south of the Angels Palace Trail. 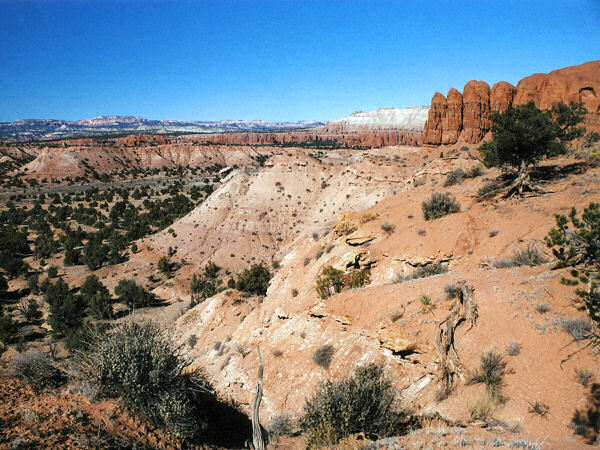 The box canyons are picturesque with the lower dark red Entrada Sandstone and the white taller Dakota Sandstone cliffs towering behind. I got a bit confused near the end of this trail, since there are multiple use paths branching this way and that, you can't get lost though. Time to complete = 45 minutes. Panorama Trail: The length of this trail depends on how many of the side trips you feel like taking. Supposedly, if you take them all you'll hike about 5 miles. The side trips definitely take time, but they provide close up views of some interesting geysers (sand pipes), rock formations, hand prints, box canyons, deep, dark, undercut alcoves and view points. Be aware that the main section of this trail is multiple use and sees traffic from horse drawn carriages and bicycles. I pedantically hiked each and every detour on this trail completing the loop in 2 hours 45 minutes. The author and his wife hiked all the trails in the park except the Eagle's View Trail (we ran out of daylight), then paid the $4 for a very welcome shower (though the water could have been warmer).